I love ghost books and this one is not only about ghosts but is about real ghosts. Dan Baldwin takes us on a journey through Ghost Towns to contact and interact with real ghosts of miners, outlaws, and pioneers of the Southwest United States. I love how he gives us a bit of history about each place visited in the book. I like how they communicate with the spirits. They mainly use a pendulum. I have a pendulum and have used it many times over the years with results. So I know you can communicate with one. He does get a little long winded when it comes to telling us how they investigate and it does get a bit redundant when he says it over again at each place they visit. 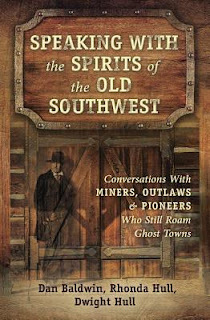 But other then that I really enjoyed the book and will be looking for more books by Dan Baldwin.